Monument to Archdeacon Hodson (c.1787-1855). 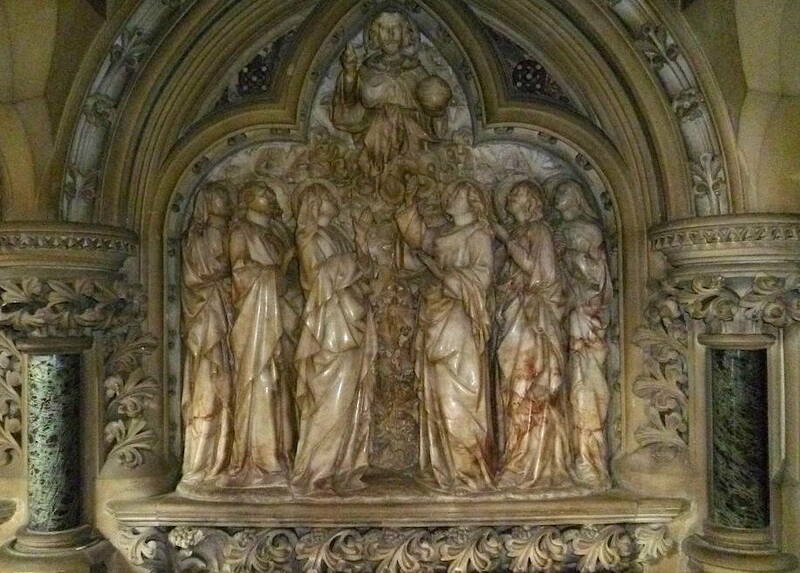 Carved by Thomas Earp (1824-81) for the architect George Edmund Street (1823-93). 1860-62. Made of various materials, especially alabaster for the carved panels and serpentine for the slab on top of the tomb-chest, which has a brass cross inlaid in it. 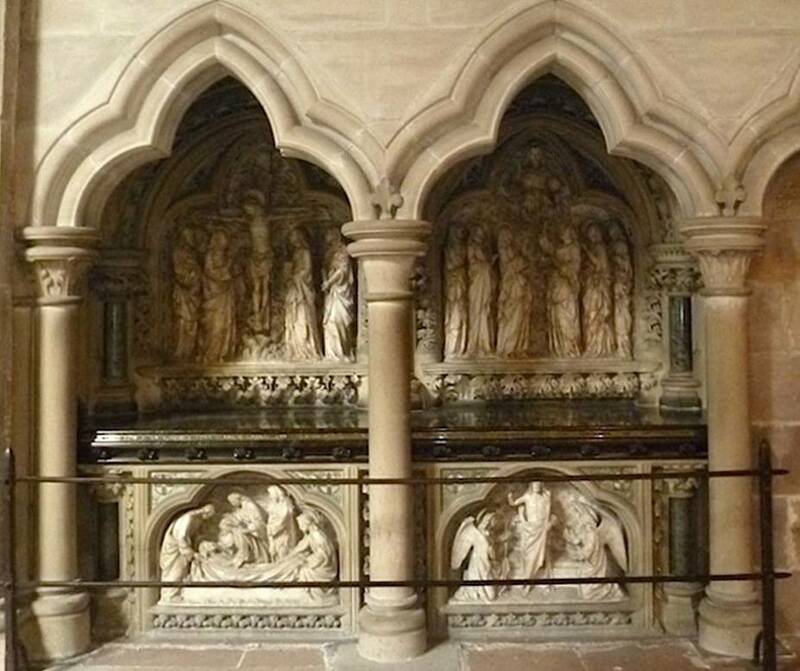 It is set behind two arches, deep into the south choir aisle wall of Lichfield Cathedral, Staffordshire. The Archdeacon was an Evangelical, who had been educated at Cambridge but became Bishop of Oxford, then Archdeacon of Stafford from 1829 to 1855 — in the summer of which year he died of cholera whilst in Italy. He was buried at the pretty and popular tourist spot of Riva, by Lake Garda. Left: Jesus being laid in the shroud for his entombment, on the left of the tomb-chest. Right: Next to the entombment, on the right side of the tomb-chest, the Resurrection. This is in need of restoration. 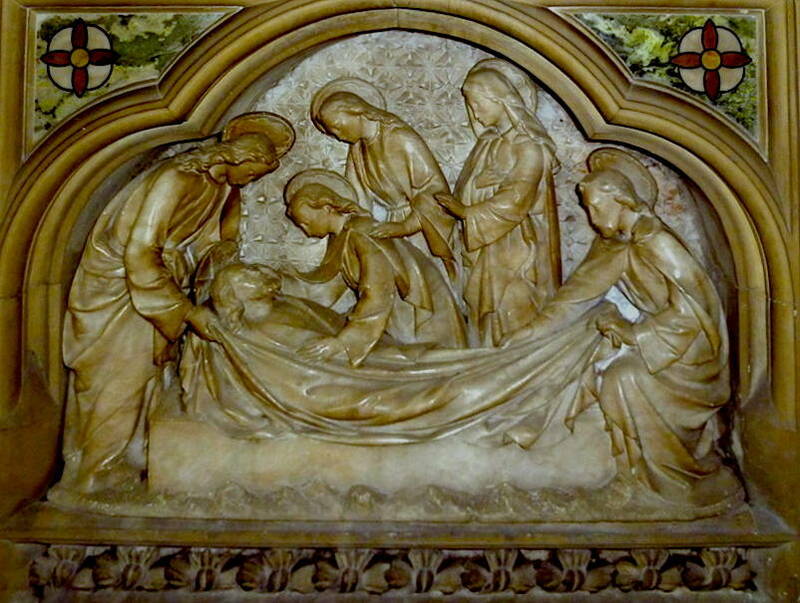 The memorial is carved in deep relief with four biblical scenes, each quite crowded with figures. Nikolaus Pevsner finds the memorial to the archdeacon's son, on the other side of the gates leading to the south transept, "[t]otally unlike the Street one knows" (185), partly because of its "busy scenes." He then says dismissively of this monument too: "Also with scenes of many figures." Possibly the architect gave the trusted Earp, with whom he often worked, more rein here than usual. But another commentator points out that the scenes on the Archdeacon's memorial are arranged vertically, with slenderer and often upward-looking figures, with the result that it has a calmer atmosphere than the son's memorial, "as would be considered appropriate in a monument for a churchman" (Noszlopy 232). 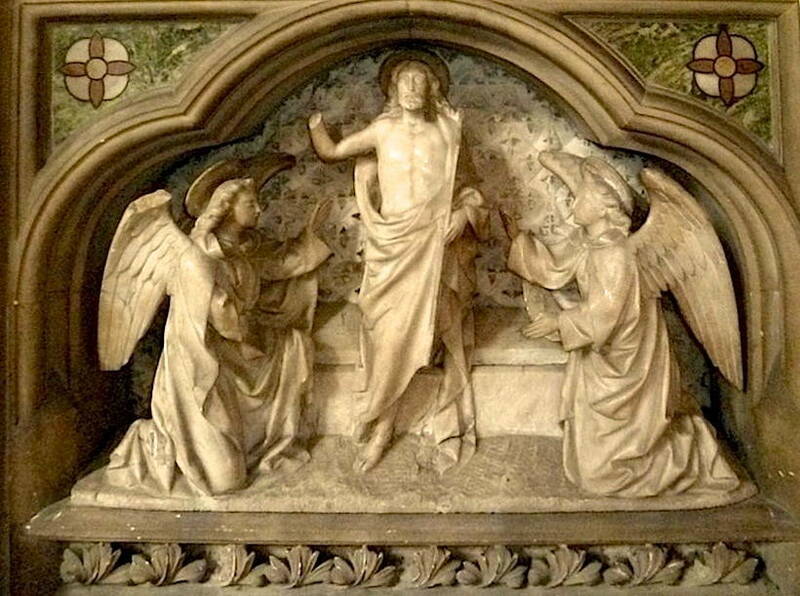 Above the tomb-chest, and next to the Crucifixion — the Ascension. Perhaps this scene is the most successful. It is both symmetrical and varied in its range of detail — in the crisp folds of the garments, the more organic foliate surrounds, and the intricate in-filling of the space between the sets of three figures. Pat Scaife describes the memorial as "particularly elaborate, using a variety of materials and techniques" (9). Photographs, text, and formatting by Jacqueline Banerjee. Photographs reproduced here by kind permission of the Chapter of Lichfield Cathedral. Click on the images for larger pictures. Pevsner, Nikolaus. The Buildings of England: Staffordshire. London: Penguin, 1974. Print. Scaife, Patricia. The Carvings of Lichfield Cathedral. Much Wenlock, Shropshire: R. J. L. Smith, 2010. Print. "The Venerable George Hodson, Archdeacon of Stafford" Obituary in the Illustrated London News, 3 Nov. 1855, p.555. londonancestor.com. Web. 20 June 2013.